An Eventful Month | Let's Live Forever! It was a fantastic birthday present—not just because we could spend my birthday together at home, but also because he was okay. At the final follow-up appointment last Friday the doctor said to just go home and forget about it… there was nothing wrong with him. We thought this anyway, but it was very nice to have it confirmed. One thing that Frank said helped him during his hospital stay was the two distance Reconnective Healing sessions I organised for him with my blogging friend Jenny Mannion. Jenny is in upstate New York and we are in Melbourne, Australia. Jenny has written about distance healing in her blog post here: Distance Healing. For the first session, late on our Saturday night, Frank didn’t know about it until I told him the next day, and for the second, late on Sunday night, he knew in advance, and he lay still and told the others he was meditating! He felt a warm glow/energy descending over him during the session, and some other sensations and awarenesses—he felt that it really made a difference. So thanks Jenny! I met Jenny through blogging and had never heard of Reconnective Healing before starting this blog—I remember saying recently on Vered’s mommy blog that the benefits of blogging may not necessarily come through having thousands of readers. I think I have confirmed this for myself very nicely. Another thing that Frank said helped him throughout the whole thing was reading the Life and Teaching of the Masters of the Far East books. He says he loves these books, and he is on book 3 at the moment. I got off on book 1, but found myself skimming through the others… we are planning to order the last book, book 6, from Amazon soon. 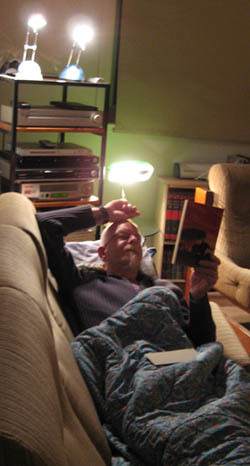 On the right is him reading one of them before we decided we had to get him to the hospital—I think the lamps look pretty funny, especially his halo (it was his idea I put this photo in). At least Frank’s hair looked tidy while he was in hospital, because he had his dreads fixed up by the rasta guy down in Smith Street the day before being admitted. I’ve had my dreads fixed, too—I figured I may as well keep my hair appointments while I was too distracted to do anything useful. I think my hair looks better—Frank said I look like a little Dutch girl, which I’m not sure is a compliment to the sophisticated woman of the world that I am. He said it was a compliment. So now I am 56! We went down to the pizza place for dinner, and unfortunately were harassed by a woman with mental illness who roams around (we always sit outside), and as we were both feeling rather vulnerable and shaky we didn’t handle it as well as we usually would, and things escalated and got very upsetting. After she was dragged off by the police we ended up having an enjoyable night (she was back 20 minutes later but didn’t bother us). 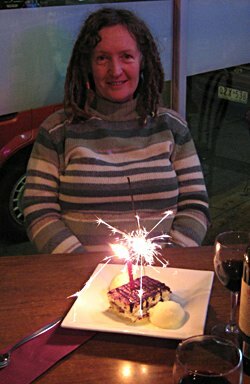 I had tiramisu with a candle and a sparkler for birthday cake and Frank and Rachael the waitress sang Happy Birthday! To top it all off I have been dealing with not one but TWO hard drive failures! About a week into June my iMac wouldn’t start up, and the prognosis from Apple telephone support was that the hard drive “table” was corrupted and I would have to erase the hard drive and re-install the operating system, which I did. Luckily I had a backup of my home folder and all my downloaded software DMGs on an external LaCie hard drive, which I update with a program called SilverKeeper. I hadn’t done a backup for 5 weeks (I’d been getting slack), but luckily all this coincided with my computer break, so I didn’t lose much. It took quite a while to get her up and running again… installing this, updating that. Then 10 days after the first failure it all went pear shaped again! This time it was obviously a hardware failure—and two local Apple guys came around to replace my hard drive. While standing there watching the grey screen as the iMac was trying to start up, they decided that the dark grey smudges in 3 corners of the screen were a warranty issue too, and they could replace the screen too, but they would have to take her away. Which they did, and after 8 days of me having no computer except for Frank’s laptop for checking Facebook, my iMac now has a new hard drive, screen and logic board (the logic board happened last November), and my 3-year AppleCare warranty expires in 3 months time. I can only conclude that this is a good thing! Except that it is taking me a while to gradually bring everything back (a cleanout isn’t such a bad thing, though). 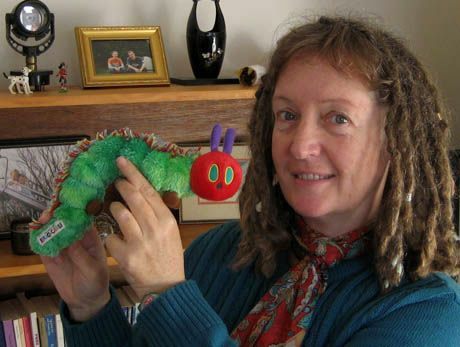 I’ll finish up with a photo of me with the caterpillar Frank gave me for my birthday – we had been admiring him in the window of the local bookshop, and Frank went and bought him over a week before my birthday! Well that’s it for me, for now. I’m hoping to be back to posting once a week again, and I’m looking forward to dropping over to my blogging friends over the next few days to see how everyone is going. Cheers! Happy birthday! I’m so glad Frank is OK.
Yeah for Frank and your miracle of wellness. I love your dessert and am only 8 months younger but no sweat cuz were living forever! Happy Birthday and we’re glad you’re back. .-= Tess The Bold Life´s last blog ..Magic Monday Freebie with Steve Pavlina =-. Hi Robin – Congratulations on your birthday! (I am one year behind you) I was sorry to learn that Frank was ill, but very intrigued about the role Jenny’s healing played in his recovery. How fascinating! And so glad to see you back in my reader. .-= Betsy Wuebker´s last blog ..ADVENTURES IN CUSTOMER SERVICE: WELLS FARGO DUMPS ON A GRIEVING MOTHER =-. Happy B-day Robin! Are you my fellow Gemini or Cancer? Your house looks cute. You are much better photographer than I am. 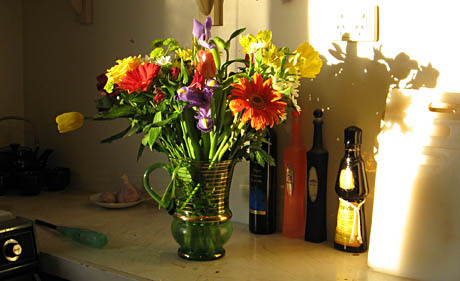 Especially the first photo of flowers — great lighting! It’s interesting to read about Jenny’s distance healing. Glad both of you are doing well. .-= Akemi – Yes to Me´s last blog ..Are You Afraid Of Finding Bad Things In Your Akashic Records? =-. Happy Birthday Robin! I’m so glad Frank’s OK. And I love the story about Jenny giving him long-distance healing. That tiramisu looks yummy! Hello Robin, I was checking into your website yesterday and wondering what happened to you. Looks like June has been quite a challenging month for you, huh? Glad to know that Frank is well and things are beginning to settle back to normalcy again. It’s also great that you contacted Jenny for long distance healing sessions. I am also particularly interested in long distance healing and know that it works since I do it almost every other day. I’m hoping to improve my skills even further. Your tiramisu looks delicious!! Your caterpillar looks like the one from the story Hungry Caterpillar by Eric Carle. Happy Belated Birthday!! May all your dreams and wishes come true! .-= Evelyn Lim´s last blog ..How to Prevent H1N1 Flu Naturally =-. @Vered – thanks for your thoughts, Vered! @Tess – yeah – age isn’t anything, is it? Thanks Tess – glad to be back. @Betsy – thanks Betsy – I’m glad to be back in action – the situation called for something a little unusual, I felt. @Akemi – Thanks Akemi! I’m a Gemini. Thanks about the photos – things got very mixed up when my computer went down. @Marelisa – thanks Mare – the tiramisu was indeed very yummy! @Evelyn – yes you could say it was challenging! What “sort” of long distance healing do you do? He is indeed the Eric Carle caterpillar – he is very cute. And thanks! Hi Robin. What a great birthday present, to have Frank come home, healthy. I’m glad that he is okay. Interesting how the cops dragged that lady away and then 20 minutes later she was back again. Good that she stayed away from you guys the second time. I can see how that would have been upsetting after what you’d both just been through. It’s great to see you back. Belated Happy Birthday! Little Dutch girls are unbelievably cute! What a busy month you had. That’s great Frank got out of the hospital in time to celebrate your birthday. Happy Birthday! I found that fascinating how Jenny helped with the distance healing. I had never heard of Reconnective Healing, but have heard of how we can pray for others near and far, so I’m guessing it’s similar. It sounds like you’re ready to settle back into your schedule. You’ve got your computer back up and running, Frank in doing well, and you have that cute little caterpillar to admire at home – instead of in the bookshop window. Life is good, hey? .-= Barbara Swafford´s last blog ..How To Capitalize On Your Blog Statistics =-. @Davina – you know, I didn’t mean to make such a big deal of my birthday – it just fitted in with the overall drama of the occasion! – I wasn’t even going to mention it this year. Frank was my overwhelming concern! The woman and others live in a home and are supposedly looked after, but this one roams in her pyjamas all night. Thanks, Davina – I’m glad to be back. @Jannie – ha ha I’m (almost) not the only one!! I think we would call this one a quilt – it isn’t thick enough to be a doona. I ‘spose cute is passable. @Barbara – Life is indeed good! I think the distance healing modalities and praying for someone would be very similar – The Intention Experiment is another one. Hi from my caterpillar! Hi Robin – I’m glad your birthday turned out great – aside from the mental woman. And you look nowhere near 56. It is brilliant that Frank was able to benefit from Jenny’s distance healing from all those miles away. Wish you a very happy birthday. Wishing that the coming year will be the best year yet…. .-= Shamelle- TheEnhanceLife´s last blog ..Jumpstart Your Initiative, You Have Waited Long Enough =-. It’s great to see you back here. And happy birthday to you!! To the idea of Frank having to tell you that the compliment he gave you was a compliment – I laughed out loud!! I can relate to this all too well! On way more than one occasion, I’ve given my wife a compliment..that I later have to explain was a compliment! So…I love it (Frank…if you’re reading…I understand!!). And very awesome what Jenny did with Frank! She is a pretty special lady, and I think it’s awesome you two had the opportunity to work together. .-= Lance´s last blog ..Through The Eyes of Truth =-. Happy birthday beautiful woman 🙂 You look hot! So happy for you both that all is well with Frank… we all need a little special attention now and then. Great caterpillar… I almost bought one exactly the same recently for no other reason than he was nice, but didn’t….. maybe we were in sync? I think it’s healthy to have time out from the cyber world. Sometimes we have to be forced into these things. I don’t do facebook, but my partner has just got into it and loving it as he has rekindled old friendships from NZ. Enough from me… great to see you out and about again. PS… going to check out Jenny now. .-= Ribbon´s last blog ..bored Kangaroo… =-. It was so nice to see a personal post after all the stress you two have been through. I’m glad Frank was able to go home on your birthday, and so glad that he’s okay. The Reconnection is just the thing that was suggested for me, and I’ve read up on it. I’m glad to hear that Frank felt it helped. Losing not one, but two, hard drives during that period is almost asking too much of you! Your new hairdo looks great, and your face always has, so full of kindness and gentle energy. Tiramisu for birthday cake, what a great idea! I like the sparkler too. The caterpillar is very cute (I was afraid you meant a live one at first). I hope all is settled or settling back into place now and you can heave a sigh of relaxation and peace. .-= Dot´s last blog ..Comment on My Mother Has Passed by Davina =-. May you live one thousand years and may each day be as happy, may you always learn from a mistakes, and may your mistakes be soon forgotten. .-= Miguel de Luis´s last blog ..The Knowledge Artisans =-. Wow, that does sound like an eventful month to me. I can see from the pictures how calm and warm you’ve been able to stay nonetheless. .-= Chris Edgar | Purpose Power Coaching´s last blog ..10 Motivational Metal Masterpieces =-. @Cath – thanks Cath, and yes I thought it was brilliant, too. I can tell you I’m looking pretty worn-out at the moment. I forgot to mention that I had chest congestion for most of the month – I had to try not to cough in the emergency department so they wouldn’t make me wear a mask – there is such a fuss here about the flu. @Shamelle – lovely to see you again! Hope you have a great year, too! @Lance – thanks for the Facebook messages – I really appreciated it. Yes it was great working with Jenny – we talk on Skype. Laugh at your complimenting strategy dilemmas. @Ribbon – oh yes – that is much better. I think that maybe we are in sync – and he wouldn’t be such a bad impulse buy – I haven’t worked out where to put him, yet. I’m enjoying Facebook – I much prefer it to Twitter. Your kangaroo is so funny! @Dot – thanks Dot – LOL at the live caterpillar – we do have some live ones and they have eaten a couple of our chili plants that I posted a picture of a while ago. I’m starting to relax now – thanks for everything. @Miguel – thank you Miguel! You too! – and great to see you again. @Chris – Thanks – but I dunno about calm and warm. I went into automatic pilot and went into exhaustion afterwards – I seemed to regress years emotionally. Thanks for your thoughts! Backing stuff up is so easy to forget to do…. Happy Birthday, and the colors in that photo really are beautiful. Happy Birthday to you and wow what a month. I was so pleased to see all your pictures and hair cuts – feels good doesn’t it! 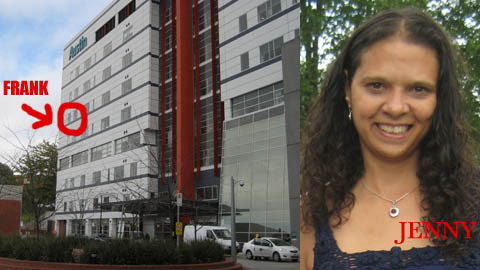 Taking care of yourself and Jenny’s helpful healing from New York to Melbourne. I have been working with a Medical Intuitive in Oregon, not quite so far but very helpful. I am so enjoying all the connections with fellow bloggers – so many ways and so much sharing. So glad that Frank is ok and doing well, your birthday looked quite fun…I am going walking in Scotland for my 60th…don’t think I will have haggis though to celebrate! .-= Suzie Cheel´s last blog ..What Am I Grateful For Today? =-. @Paul – indeed – and thanks. @Patricia – thanks for everything Patricia, and have a great time in Scotland. I can understand your reservations about haggis! @Suzie – I must talk to you about your session with Jenny some time. Enjoy your spinach pie! Happy birthday and I am glad to hear that all worked out for Frank! I experienced distance healing a couple of years ago. It is amazing what we are capable of. .-= Mark´s last blog ..News Flash – It’s Not Fair! =-. Whew! I was exhausted just reading that. What an up and down month for you! I am so glad that Frank is okay, and Happy Birthday to you! .-= Eliza´s last blog ..Understanding weight gain after 40 =-. Cheers and well wishes form Pittsburgh Pa. Go Frank you aren’t done yet! I imagine living with the live forever gal makes you young. It’s always a delight to hear about your life. .-= Tom Volkar / Delightful Work´s last blog ..To Hell With What They Say =-. .-= Giovanna Garcia´s last blog ..Are you suffering from the Chronic “Yes, but” Syndrome? =-. @Mark – hi there Mark – thanks for the good wishes – it’s interesting how many people are saying they have experianced distance healing. @Eliza – Hi U.P. – I couldn’t figure out who “Eliza” was, at first. Yes, I hope so – thanks. @Tom – Thank you Tom! I think he makes ME feel young – Frank will probably check out these comments soon. @Giovanna – yes aren’t they! Great to hear from you, Giovanna. hi robin, glad frank is home and is feeling better…that had to be quite a scare having to take him to the emergency room. hope you enjoy the day of your birth. you certainly don’t look 56.
and whenever i read stories about people and their computer’s crashing, it’s always a reminder that i need to back up my stuff, or else. .-= Natural´s last blog ..Why Wait, Buy Now! =-. Happy Birthday! I’m so glad that Frank is better. .-= Mama Zen´s last blog ..Fearless =-. @Natural – thanks Val – and yes, back up! @Mama Zen – thank you Fearless Mama! I’m so glad that Frank is doing well.It also wonderful that distance healing sessions did him good. Give my kind regards to him.C ya again. .-= vikum´s last blog ..The power of focusing =-. Thanks Vikum – I hope the exam wasn’t too painful. Good to have you back!